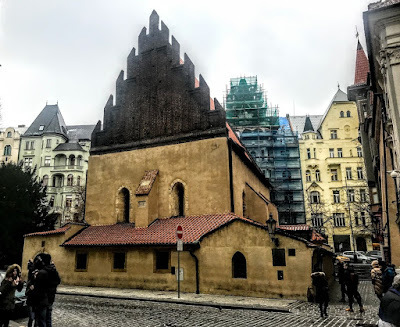 The Jewish Quarter has six synagogues, as well as the Jewish Ceremonial Hall and the Old Jewish Cemetery, the most remarkable of its kind in Europe. The Old-New Synagogue or Altneuschul is the oldest landmark in the Jewish town in Prague, and the main house of prayer for the Jewish community in Prague to this day. It was built in the 13th century in the early Gothic style and is the oldest preserved and oldest active synagogue in Central Europe. 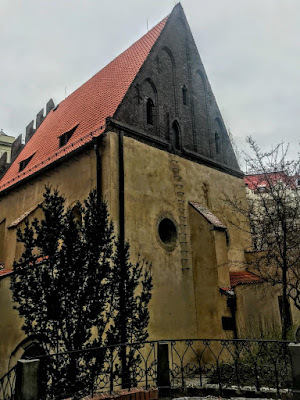 The Old New Synagogue was completed in 1270 in the Gothic style, and it is one of Prague’s first gothic buildings. A still older Prague synagogue, known as the Old Synagogue, was demolished in 1867 and replaced by the Spanish Synagogue. The synagogue was originally called the New and Great Shul or Synagogue. But after the establishment of other synagogues in the ghetto in the late 16th century, it became known as the Old-New Synagogue. According to legend, angels brought stones from the Temple in Jerusalem to build the synagogue in Prague – ‘on condition’ that they are to be returned when the Temple in Jerusalem is rebuilt and the stones are needed. 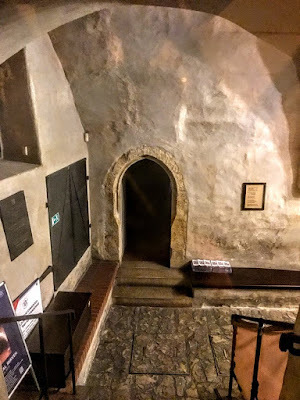 Nine steps lead from the street into a vestibule, from which a door opens into a double-nave with six vaulted bays. This double-nave system was most likely adapted by the synagogue’s Christian architects from the plans of monasteries and chapels. It has been suggested that the synagogue was built by the same workshop that completed the nearby compound of Saint Agnes’s Convent. The moulding on the tympanum of the synagogue’s entryway has a design that incorporates 12 vines and 12 bunches of grapes, representing the 12 tribes of Israel. Two large pillars aligned east to west in the middle of the room each support the interior corner of four bays. The bays have two narrow Gothic windows on the sides, for a total of 12, again representing the 12 tribes. The narrow windows are probably responsible for many older descriptions of the building as being dark. It is now brightly lit with several electric chandeliers. The vaulting on the six bays has five ribs instead of the typical four or six. It has been suggested that this was an attempt to avoid associations with the Christian cross. However, many scholars dispute this theory, pointing to synagogues that have four-part ribs, and Christian buildings that have the unusual five rib design. The almemor or bimah from which Torah scrolls are read is located between the two pillars. The base of the bimah repeats the 12-vine motif found on the tympanum. The Aron-ha-Kodesh where the Torah scrolls are kept is in the middle of the eastern wall. There are five steps leading up to the Ark and two round stained glass windows on each side above it. A lectern in front of the ark has a square well a few inches below the main floor for the service leader to stand in. The stone pews along the longer walls have been preserved from the original mediaeval furnishings of the synagogue. The 12 lancet windows in the synagogue – five each on the south and north wall and two on the west wall – are said to have inspired worshippers to compare the building with Solomon’s Temple. The synagogue follows Orthodox custom, with separate seating for men and women during prayer services. Women sit in an outer room with small windows looking into the main sanctuary. The framework of the roof, the gable, and the party wall date from the Middle Ages. An unusual feature in the nave of this synagogue is a large red flag near the west pillar. In the centre of the flag is a Star of David and in the centre of the star is a hat in the style typically worn by Jews of the 15th century. Both the hat and star, forming the emblem of the Jewish community in Prague, are stitched in gold. In gold stitching too is the text of Shema Yisrael, the basic Jewish confession of faith. The synagogue was restored by the architect Joseph Mocker in 1883. Local lore says the body of the Golem, created by Rabbi Judah Loew ben Bezalel, rests in the attic which is the genizah or storage space for worn-out Hebrew-language religious book and papers is kept. A legend is told of a Nazi agent during World War II broaching the genizah, but who died instead. The Gestapo never entered the synagogue attic during World War II, and the building was spared during the Nazi destruction of synagogues. The lowest three meters of the stairs leading to the attic from the outside have been removed and the attic is not open to the general public. But it is said no trace of the Golem was found when the attic was renovated in 1883, or when it was explored in 2014.